Trick or treating, bobbing for apples, carving pumpkins, and eating lots of holiday treats are all a big part of a modern Halloween. But where did all this scary stuff come from, and why do we celebrate all that is dark and frightening on October 31st? Unveiling the origins of Halloween requires a quick trip back in time - to the days of the ancient Celts - when autumn's shorter days and longer nights conjured up long, ghostly shadows and feelings of dread. To dispel the darkness, prehistoric tribes would light huge bonfires, carve scary faces out of gourds and turnips, or recite magic incantations to scare away the evil spirits. As with many customs that came from across the sea, immigrants brought their Halloween traditions to American shores beginning in the mid-1800's. Eventually, the carved gourds were replaced by pumpkins. The tradition of "guising" evolved into trick-or-treat. 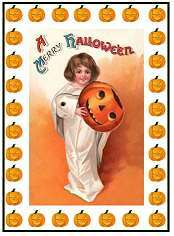 By the late 19th century, the first Halloween greeting cards in America were offering now-familiar images of witches, jack-o-lanterns, or cute kids in ghostly costumes together with best wishes for "a Merry Halloween". By then, mischievous tricks played on Halloween also found their way to US shores when soaping windows became a favorite Halloween pastime. What to do? In the early 1920's, the town of Anoka, Minnesota already had the answer. It was America's first Halloween parade -- mainly staged as a distraction from acts of civil disobedience. But the idea was such a great success that Halloween parades have been staged there every year since. 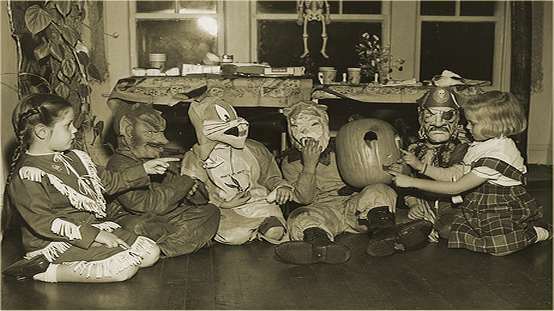 By mid-century, Halloween was in full swing throughout the nation. Joining in all the Halloween hoopla were candy manufacturers, greeting card companies and costume makers who were more than happy to provide mass helpings of Halloween. Although mom had always been responsible for Halloween guises, by the 1950's costume manufacturers kept an eye on the pop culture of the day by churning out Bugs Bunny getups as well as pirate, cowboy and cowgirl costumes. Of course, Hollywood had already gotten into the act by the 1940's when horror movies and classic thrillers (such as Hitchcock's Spellbound opening on October 31, 1945) were released on Halloween night to attract Halloween revelers. Since then, The Night of the Living Dead (1968) Halloween (1978) The Nightmare Before Christmas (1993) and Paranormal Activity (2007) have all been unveiled for release on or about the scariest night of the year. And Halloween isn't just for kids anymore. Today the grownups are threatening to take over the holiday with adult Halloween party celebrations ranging from Halloween cocktail parties to club raves. So why the fascination? It's might be a chance to be someone else for a little while, or celebrate the dark and the mysterious -- or simply a sense of wonder about the unknown that kids of all ages never seem to outgrow. The History of Halloween - A fun, popular read for kids of all ages, including origins and traditions, worldwide celebrations, favorite hauntings in American history and more Halloween fun facts from the History Channel. The Celtic Year - October - The ancient Celtic holiday as the basis for Halloween, with descriptions of pagan rituals and beliefs including apple magic and the bonfires that blazed throughout a Celtic autumn. Halloween in the Middle Ages - A good overview of the transformation from pagan to Christian beliefs in a brief history of how the ancient "All Hallows Eve" became the modern "Halloween." Halloween History: The Real Origins - A bit more strident discussion on Halloween's supposed evil influences in a self-admitted "work of amateur scholarship", but well-researched including related links to off-the-beaten-track resources.